The features of Strongwell’s structural fiberglass products offer significant benefits in many building and construction applications. Strongwell’s industrial fiberglass decking systems are attractive, low maintenance industrial decking systems that are excellent alternatives to traditional decking materials that rot and chip. SAFPLANK® and SAFDECK® will not rot, rust or mildew, which makes those systems ideal for high-moisture environments, including saltwater environments. The fiberglass panels are designed to interlock for a continuous solid surface and provide an aesthetically pleasing appearance. 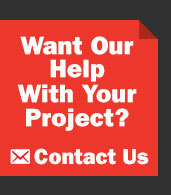 Wade Perrow Construction, LLC recognized EXTREN® as a product solution for the Seal Observation Facilities Project. Wade Perrow Construction knew that EXTREN® pultruded fiberglass structural shapes offered significant structural advantages over wood and metal. Unlike timber, EXTREN® does not rot or decay and EXTREN® is not susceptible to insect attack. 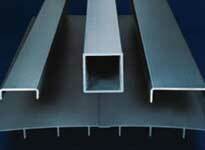 Strongwell’s EXTREN® shapes are also stronger and more rigid than timber while always remaining corrosion free. Click here to read the full case study. Durable, long-lasting fiberglass trash gates and enclosures are the superior choice for screening waste disposal and other unsightly areas. The lightweight gates and enclosures are designed to be installed quickly and easily without the need for special tools. The fiberglass materials will provide years of maintenance-free service, even in the harshest weather conditions, because fiberglass will not rust, rot, or corrode. Strongwell’s gates and enclosures resist impacts and resulting dents that detract from appearance. panels for walls in its Alaskan North Slope. 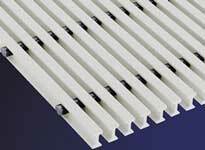 The 3” foam-core panels are lightweight and can easily tolerate a forty pound snow load and 100 MPH winds. 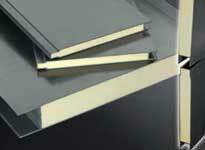 The DURASHIELD® panels also provided an "R" value of R-21 due to the integrated tongue and groove panels. 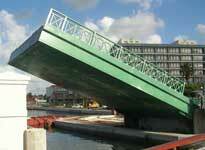 COMPOSOLITE® FRP panels because the panels are lighter than steel or concrete and were easy to assemble. 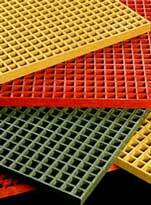 In addition, FRP offers excellent corrosion resistance. low maintenance and high aesthetic appeal. Strongwell’s DURAGRID® I-6000 pultruded grating was used to build large platforms to gain access to road de-icing chemicals in large outdoor storage tanks at the Ohio Road Department in Franklin County, Ohio. 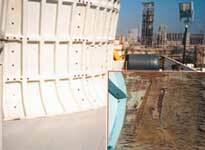 The grating allows safe access to and from the tanks for filling and inspection. The non-corrosive and lightweight nature allowed the builders to assemble the components themselves without the need for heavy lifting equipment. The city of Phoenix needed to install a walking surface at a lift station that houses a wet scrubber for foul air treatment. The station serves the Musical Instrument Museum and a senior living facility, both of which are state-of-the-art. Molded Fiber Glass and Jacobs Engineering both chose DURAGRATE® molded grating as the walking surface due to its high resin content (65%) which will provide extended maintenance free performance.